A broken hip (also called hip fracture) is a fracture that occurs in the femur (thigh bone) and often requires surgery. 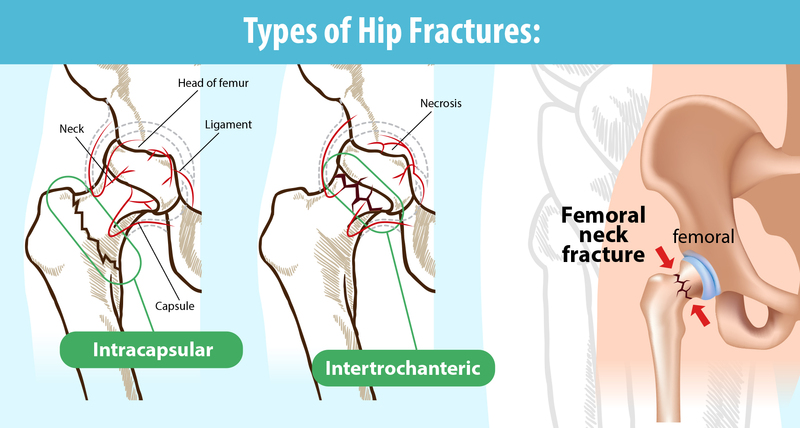 There are three most common types of broken hips, based on the location of the fissure in the femur: Femoral neck, Intertrochanteric hip and Intracapsular fracture. Causes of hip fractures include traumatic injuries, stress injuries, pathologic conditions, medication side effects and low body weight. The most prevalent risk factors for broken hips are family history of osteoporosis, age, malnutrition, ethnicity, gender, physical inactivity and smoking. 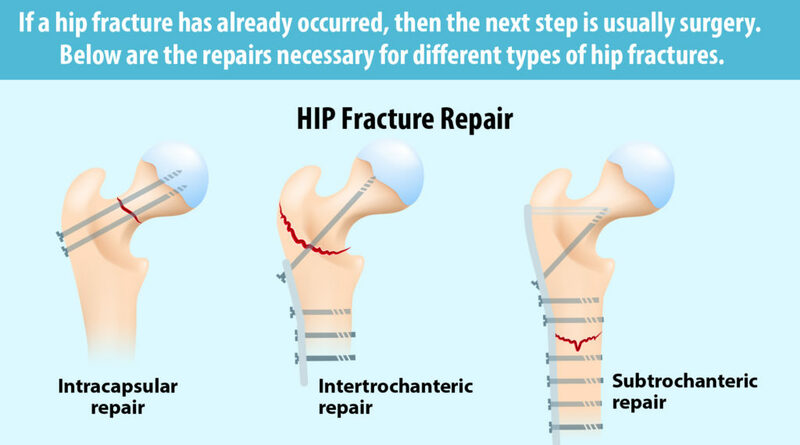 Surgery is the most effective way of treating a hip fracture. However, an orthopedic doctor can determine if treatment without surgery is an option. Hip fractures can be deadly for seniors with consequences such as pneumonia, accelerated dementia, pulmonary embolism, infection, and heart failure. The hip is a ball-and-socket joint where two or more bones converge. The ball forms the head of the femur (thigh bone), and the socket, called the acetabulum, is the curved part of the pelvic bone. The top of the thigh bone and parts of the pelvic bone meet to form the hip. A broken hip, frequently requiring surgery, is a fracture that most often occurs in the femur. 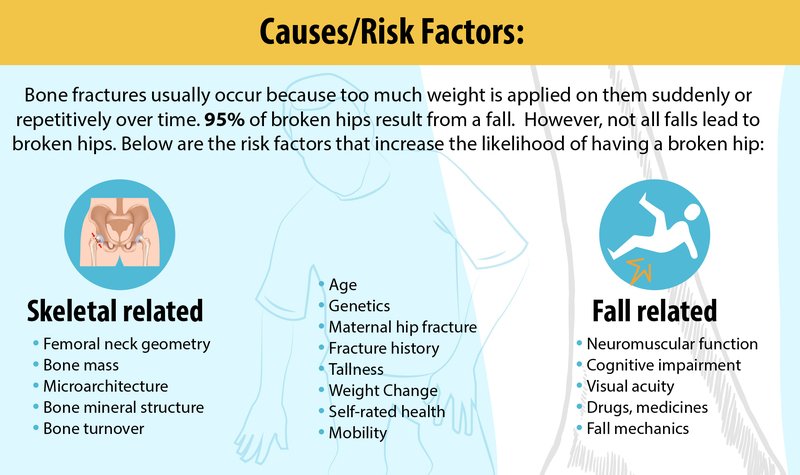 More than 300,000 Americans 65 or older are hospitalized each year with hip fractures of different types, and of those, only approximately 25% survive the initial 12 months following their fracture, while the rest live longer, though with a diminished quality of life. Physical therapy and exercise can nevertheless restore a good part of the sufferer’s strength and walking ability. It is common to associate a broken hip with a “hairline break”, or give hip fractures some definition other than what in reality they are. The fact is that there is no distinction between hip fractures and broken bones – they both reflect the same phenomenon. In the field of medicine, the two terms are used interchangeably on a daily basis. Indeed, while there are various types of hip fractures or broken hips, physicians use more specific terminology to differentiate between such types. Both hip fractures and broken hips comprise a break of one or more bones in the hip area. Broken hips are common injuries: a hip fracture typically happens in the upper thigh (femur) part of the joint and, it can occur in several places within that area. There are occasions also when the fissure happens in the socket or acetabulum. These are common among older adults and are often associated with osteoporosis. They occur in the upper thigh (femur), a couple of inches below where the tip of the thigh bone converges on the socket. This form of fracture is particularly problematic since it can cut off the blood to the head of the upper thigh bone which forms the hip joint. This type of break occurs some 3 to 4 inches from the hip joint, between the greater trochanter and lesser trochanter bones (a trochanter consists of any two protruding bones that attach to the upper thigh bone by way of muscles). It is less problematic since it does not cut off the blood to femur. Together, the femoral neck fracture and the intertrochanteric hip fracture account for some 90% of all broken hip incidents, and hip fractures occur in more or less equal numbers between those two types. The capsule is a strong and dense ligament that attaches to the various sides of the joint and contains the fluid that nourishes and lubricates the joint. This type of fissure impacts the joint parts of the hip and can also cause tearing of the blood vessels that go to the ball. Bone fractures occur either because too much weight is applied on them suddenly or repetitively over time, or because the bones become brittle as a result of certain conditions such as osteoporosis. Naturally, the precise conditions that lead to a hip fracture form the basis for specific treatment as well as for prescribing therapy and healing processes. The individual characteristics of the patient and why the fracture occurred can thus lead to different treatment guidelines. The bones break because a high-energy force is applied to them, such as from falling onto a hard surface or from a considerable height, or in car crashes or sports injuries. These mimic the symptoms of tendonitis or muscle strain, and they are harder to discern and diagnose. They come about gradually over time, and they may not involve the whole bone but nevertheless consist of hairline cracks in the femur, typically caused by repetitive motion and overuse of the hip. Conditions such as tumors, osteoporosis, and certain other diseases can weaken the bones and make them brittle and easy to break, or cause the weakening of the capsule that nourishes and lubricates the joint. Thus, a pathologic fracture occurs as a result of a disease, rather than an injury. A pathologic fracture occurs when least expected, commonly when someone is conducting ordinary tasks. For example, common actions like coughing, stepping out of a car, or bending over can cause a fracture to a bone that’s been weakened by an illness. The underlying diseases erode the strength of the bone to the point where it can no longer support the usual weight placed on it. A tumor, for example, can eat away at a point in the bone, causing it to become the focal point of the break. Using considerable amounts of thyroid hormones for a problematic thyroid, to cite one example, can cause issues in bones. In addition, several frequently prescribed medications diminish bone mass and density. The same effect can emanate from some cancer drugs, medications that treat endometriosis, and medications that contain a steroid called glucocorticoids that are used to control conditions such as asthma and arthritis. If you are worried about bone health and potential fractures, make sure to discuss with your doctor if you are on any of these medications. Low body weight in women in particular involves smaller bones that put them at higher risk for osteoporosis. With age, the density and strength of the upper thigh and other bones decline, making people age 60 and over particularly vulnerable to broken hips as a result of falls, with vision and balance issues often cited as the main culprits. According to the U.S. Centers for Disease Control and Prevention, 25% of Americans aged 65 or over fall each year, resulting in 2.8 million injuries treated in hospital emergency rooms, including 800,000 hospitalizations and 27,000 deaths. The financial toll for older adult falls each year may reach $6.7 billion by 2020. Protein, vitamin D, and calcium are the vitally needed nutrients for healthy bones, and deficiencies in these will commonly result in greater vulnerability for weakened bones and broken hips, a particular problem for older adults. Vitamin D has been proven essential for maintaining strong bone health. As people age, they tend to get less vitamin D from natural sources such as sunlight or foods such as fish and milk. Supplements are often needed to restore the body’s optimal levels. If you’re of Asian or Caucasian origins, or if you’re a woman, you’re at higher risk for osteoporosis. With women, this vulnerability owes it to the fact that they have smaller bones than men and lose bone mass more rapidly than men because of post-menopausal hormonal changes. With ethnicity, the greater vulnerability also owes it to bone mass and density compared to other ethnic groups. African-American and Hispanic women are also at risk, but less so than Asian and Caucasian groups. It is also important to acknowledge that men can also get osteoporosis – it is just less common. Exercise will strengthen bones like it does muscle groups, and being inactive will increase your chances of developing osteoporosis. Cigarette smokers absorb less calcium from their normal diets. Women smokers are particularly vulnerable because of lower levels of estrogen in their bodies. In general, smoking is bad for your bones, so to lower your risk of osteoporosis and fractures, you should refrain from smoking. In addition, heavy drinking can contribute to thinning of the bones and make fractures more likely. The National Osteoporosis Foundation also emphasizes the importance of eating enough fruits and vegetables, and not consuming too much protein, sodium, and caffeine. The most likely outcome is that you will feel pain as you attempt to move, or as you touch the hip or upper thigh bone area. When that happens, you may also faint, or feel nauseated or sick. You may hear a sudden crack or snap as the bone fractures, or a grating or crushing noise. You may feel a gradual bruising or tenderness around the hip and buttock areas, or you may feel and observe some swelling. In severe breaks, for example as a result of a car accident or extreme sports injury, you may actually see the femur stick out through the skin. When the break is small, as in a hairline break, you may actually not feel anything for a while, until some other symptoms like pain or swelling begin to appear. 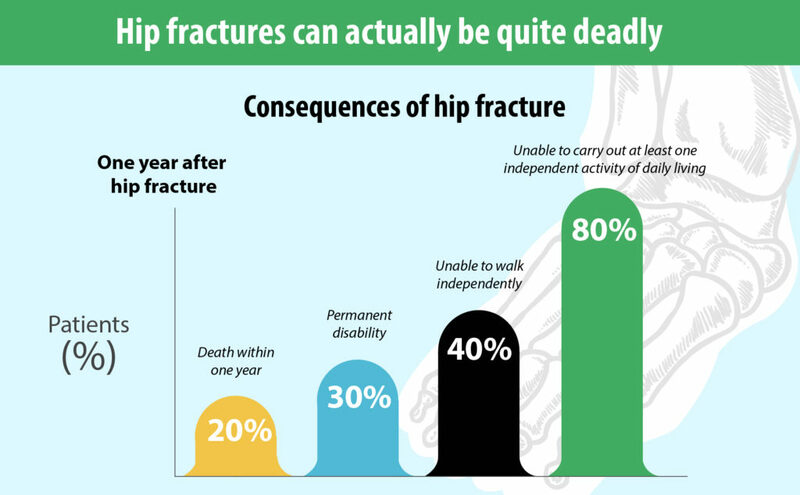 The average age of individuals who experience hip fractures is 80. Hip fractures are also associated with high mortality rates, particularly in women who account for 80% of all broken hips. The family doctor plays an important role in assisting individuals at heightened risk of a hip fracture and thereby reducing the risk of hip fracture incidents. The family doctor can also pay attention to the simultaneous presence of two chronic conditions (comorbid) in the patient. He or she may alert you if you are at greater risk of a fracture. If the fractured bone is not displaced, there may not be any common signs of a shortened and externally rotated leg, or there may not be any obvious fracture for other reasons. In such cases, and if the pain persists, the X-ray may not show a fracture, and repeat X-rays, CT or MRI may be required. The surrounding pelvic bones may also need to be assessed. Caution needs to be exercised as people are often confused or disoriented post-fracture. 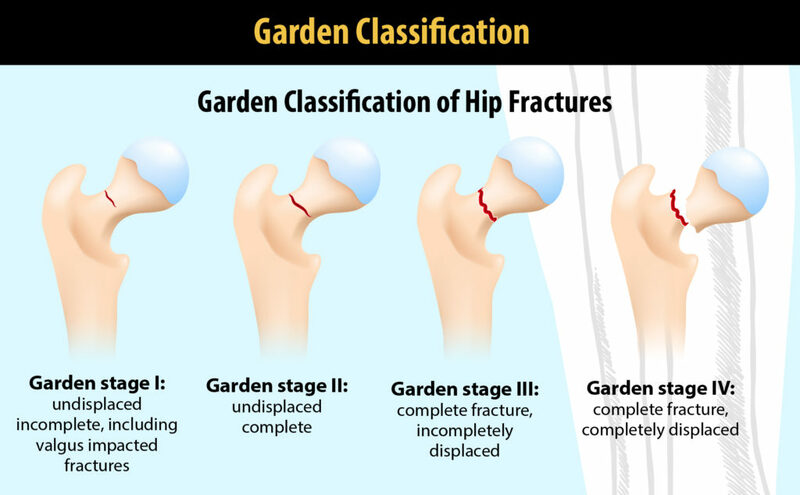 In general, Garden stages III and IV are unstable fractures that are treated with the surgical reconstruction or replacement of the joint (arthroplasty). By contrast, stages I and II are stable and can be treated by “internal fixation” (a process that uses pins, screws or other metallic devices to properly realign fractured bones, and then fixate and stabilize them). Surgery is the most effective way of treating a hip fracture. Nonetheless, if the patient is 95 years old, was not previously able to walk, or is otherwise ill-disposed to surgery (as for example with aversion to anesthesia), then the broken bones in a hip can heal by themselves under certain conditions. Once it is determined that treatment without surgery is preferred, then the patient will be given pain medications and will be encouraged to move and walk gingerly whenever possible in order to avoid some of the complications linked to lying in bed for long periods of time. Healing could then take many weeks or months, with intermittent monitoring by way of X-rays and other types of scans. The patient’s doctors would also monitor potential inactivity-related issues such as bed sores, blood clots and pneumonia. In some cases, a stay in a skilled nursing facility might be recommended as an optimal place for rehabbing from a broken hip. When an X-ray reveals that it is the neck of the upper thigh bone that is fractured, a hip-pinning procedure may be prescribed, starting with a small incision on the side of the thigh, followed by the use of special screws to properly realign the bones. This procedure can typically last between two and four hours. If the fracture is below the neck of the upper thigh bone, often involving more than one broken bone, special metal plates and compression screws are used to repair the fracture. This procedure can typically take between one and two hours. A partial hip replacement may be undertaken (aka hemiarthroplasty) when it is assessed that the hip is not likely to heal optimally using either of the above procedures. In such cases, the ball section of the joint is replaced, and the surgery may take up to four hours. There may be damage to nerves or blood vessels, or the blood supply in part of the upper thigh bone could be cut off, causing the bone to first weaken and then die. Blood clots may also arise in the legs or lungs. Parts of the hip bone may not join or properly realign in the correct position. The procedure may inadvertently accelerate cognitive confusion or dementia in older individuals who may already be at risk. Pressure sores or ulcers may become a problem as a result of spending long period of time in bed or chairs. You will need someone to follow-up post-surgery with intermittent X-rays or scans to monitor the healing and complete realignment of the bones. This involves trained physical therapists and masseurs to promote rehabilitation, the regaining of strength, and overall wellness. They teach patients how to regain adroitness and confidence in tasks such as getting dressed, getting up from chairs and bed, and other solutions to everyday chores around the house. This is a doctor specializing in all matters relating to aging or older adults. 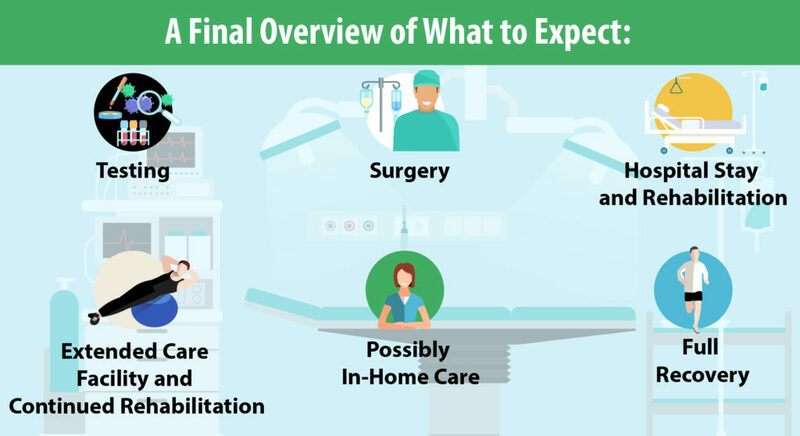 This is someone who will tie up all the loose ends relevant to your leaving the hospital, and thereafter the skilled nursing facility: medication prescriptions, wheelchairs, medical bed, ambulance and homecare services. A home health agency can provide follow-up nursing staff to monitor the individual’s overall healing and wellness. A broken bone or joint may not sound all that dangerous, but when you are advanced in age, you can pay a heavy price for broken hip surgery. You could be on your way to serious disability -or worse. For many, the best-case scenario still involves some decline in independence and overall outlook on life. A meta-study published in 2010 that involved more than half a million women and over 150,000 men over 50, researchers from both Belgium and America found the potential for death in both genders three months after broken hip surgery to be five to eight times higher. The causes of death after hip fracture surgery included pneumonia, accelerated dementia, pulmonary embolism, infection, and heart failure. Blood clots in the leg veins are a common hazard for broken hip surgical procedures. They may at times run through the heart to the lungs and cause pulmonary embolisms. Misalignment of the implants can lead to loosening, undue wear, pain, and post-surgery hip dislocation. There are also incidents when a discrepancy arises between the reach of one leg compared to the other. Infections are not as common as late onset infection or even a superficial infection, despite the fact that antibiotics are administered before, during and post-op. Over the longer term, implant loosening from the bone can occur. Loosening can be the result of infection but usually it is or the result of faulty techniques during surgery. Fractures can occur around or at the tip of the prosthetic stem, generally due to inaccurate positioning of the implant. Nickel allergies from debris from implants can cause tissue reactions and are usually produced due to improperly positioned cups. 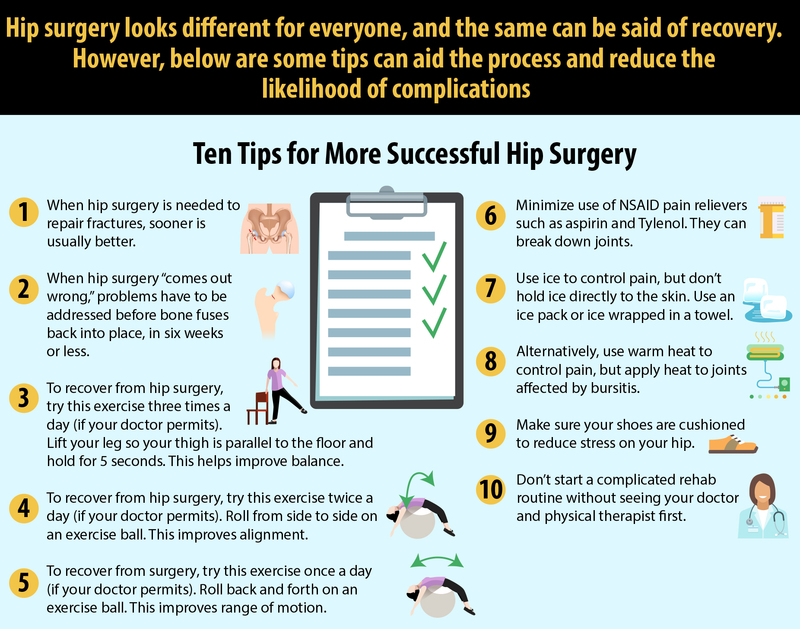 Despite all of those potential complications, the large preponderance (98%) of all broken hip and hip replacement surgeries occur without any disabling issues. An open discussion with your doctors prior to surgery will make you a more informed, and therefore more prepared, patient. As with most diseases and injuries, the best course of action is prevention. Be aware if you are at greater risk for bone thinning and osteoporosis – sometimes called the “silent disease” because it occurs without noticeable symptoms. You may not realize you have thinning bones until you fall and seriously hurt yourself. As you get older, especially if you are a post-menopausal woman, you should be aware of potential nutritional deficiencies (e.g. calcium and vitamin D), exercise to strengthen your bones and improve balance, avoid smoking and excessive drinking, monitor your medications with your doctor, and assess your home for potential fall hazards. You may also want to have your eyes checked regularly, and if necessary, use a cane or walker if you have limited mobility and feel unsteady when walking. While these precautions may feel burdensome or frustrating, they can save you from a greater deal of pain and trouble in the case of a broken hip.